“Saint or Demon?” asks the headlines. 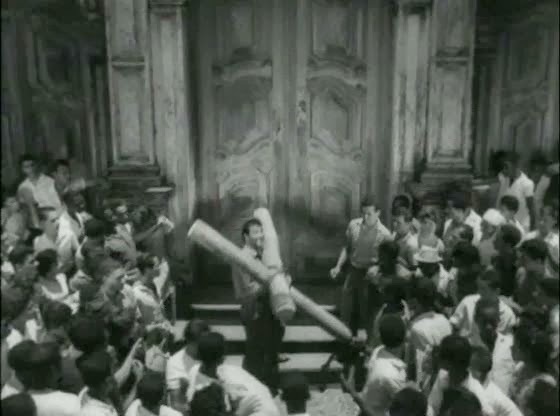 “Mystic or Agitator?” The debate is over Ze, a poor man who arrives in the early morning at Salvador’s Church of Saint Barbara having carried a cross on his back for over seven miles. Discarded behind this modern Jesus is his house (burned down) and his land (divided up among peasants). With him is his unhappy and insecure wife Rosa, who’s used to a better life. Ahead of him is the threshold of the church, the goal of a sacred promise Ze made to save his best friend, Nicolau, who ‘miraculously’ recovered. The skeptical priest finds Ze’s promise a bit exaggerated and pretentious, especially when he realizes that Nicolau is a donkey, and he's outraged to learn that Ze made the promise to Iansa (Saint Barbara’s equivalent in the Afro-Brazilian religion of Candomble). While the distinction is an abstraction beyond Ze’s simple understanding, the priest now considers the promise a pagan blasphemy and refuses to allow Ze into the church. 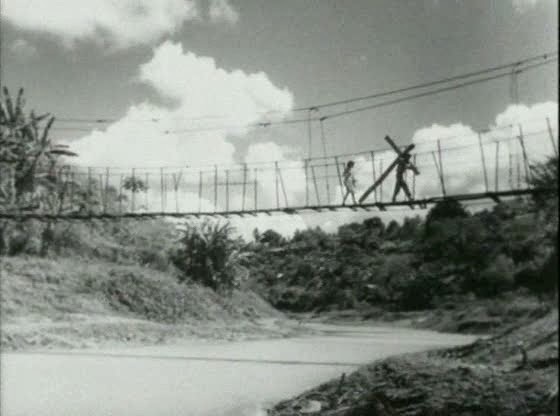 The captivating pre-credit sequence in which Ze dutifully drags a cross across desert, field, forest, bridge and alleyway tells a movie worth of visual storytelling before the first word is even spoken. Director Anselmo Duarte (an unprolific man, who never achieves the lasting fame of contemporaries Nelson Pereira dos Santos and Glauber Rocha) cleverly dispenses with Ze’s feat of endurance and allows the mystery surrounding the nature of the promise to temporarily hook the viewer as the film accumulates a mass of political and spiritual connotations. When we learn that Ze did it all to save his beloved donkey, it’s hard not to laugh, but it’s also hard not to love Ze; he’s an innocent fool, but a good man. And in contrast to the film’s deservingly thrashed but rather obvious targets (police corruption, ubiquitous moneygrubbing, Handsome’s oily opportunism, the newspaper with its recently adopted ‘new rules’), the film’s most interesting investigation is into the nature of conviction and faithfulness. Ze’s steadfast loyalty to his promise is fascinating and debated with depth, realism and economy while being thoughtfully paralleled by Rosa’s own struggle with faithfulness (albeit on a more corporeal plane), her moment of weakness and her growing need for punishment or redemption. Even the priest, ostensibly the central villain, strikes me as pretty sincere in his criticism; he is taking an unpopular stance and becomes almost sympathetic in light of the pragmatic archbishop urging him to adopt a political instead of a religious view of the matter. Duarte is an incredibly mature craftsman, and Keeper of Promises abounds with visual sophistication, especially complicated, though never ostentatious, camera movements and elaborate crowd choreography (including a demonstration of capoeira, a hybrid of martial arts and dance, during the climactic Saint Barbara feast day celebration) that’s contrasted by scenes of stark loneliness and abandonment. 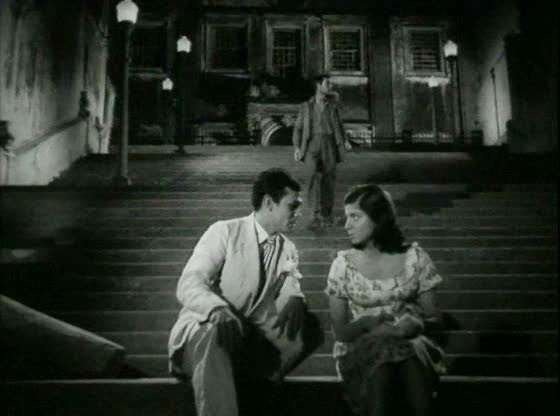 An example of the latter is Handsome’s seduction of Rosa in the rainy, seedy, predawn street, which is lent an atmosphere of predator and prey by the cinematography. There’s a meeting scene in Blondie’s café where our attention rests on the window between the speakers as we watch the multitude swarming outside, and different types of tension build in both foreground and background. It demonstrates the ease with which Keeper of Promises works simultaneously on multiple planes, both in terms of composition and meaning. The Movie Game 3.0: Categories!